Sheffield is a major UK city with a strong sense of community. Located on the edge of the Peak District national park, Sheffield is a special I was once famed for its steel industry which still bears relevance today some 279 years since steel production began. 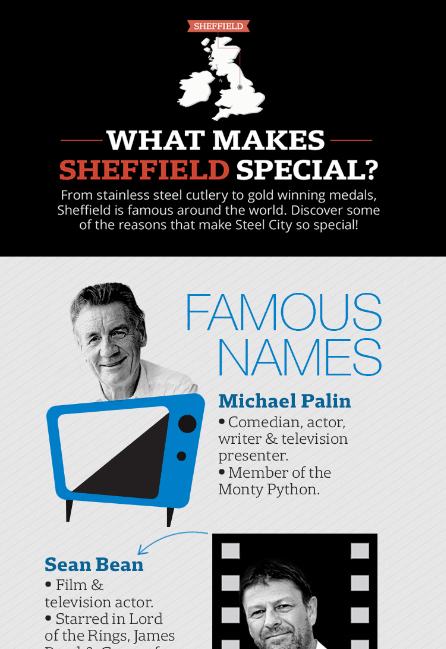 Commission and designed by Hot Tub Hire Sheffield, this infographic explores some of the famous names to have originated from this part of South Yorkshire. From internationally acclaimed designer David Mellor to one of England's most successful cricket captains, Michael Vaughan. Discover a list of Sheffield's greatest names, classified into famous names, Music legends, and Sporting icons and take a trip down memory lane with a deeper look into the key moments in history.